The day dawned cool and cloudy but thankfully the rain had stopped. Don recharged his phone and second camera battery the previous night. This was a regular job and was easy if we had a room. When we were camping he used to sit in the shower block doing his crossword for the hour or so it took to recharge. We had breakfast at 8.00 am and spoke to a young Japanese man who had holed up in Zwentendorf for a few days. We paid our host and left. The Radweg was very straightforward to Tulln. 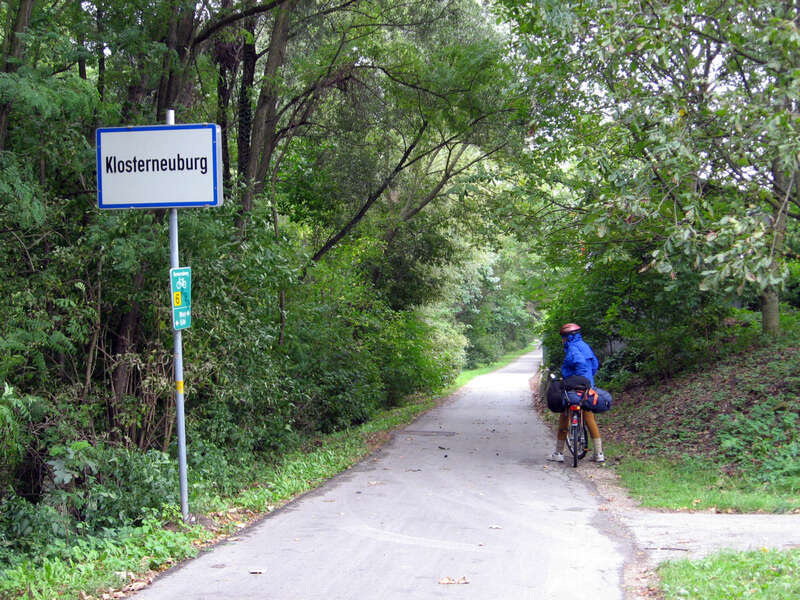 We rode on the right bank Treppelweg all the way rather than going inland to Pischelsdorf. The Treppelweg went under the bridge just before Tulln and then around an inlet and back to the river where we saw a rather nice sailboat moored. 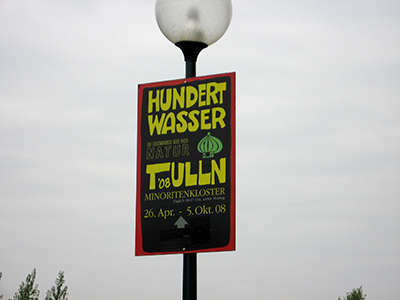 There was an exhibition of Hundertwasser artworks in Tulln. 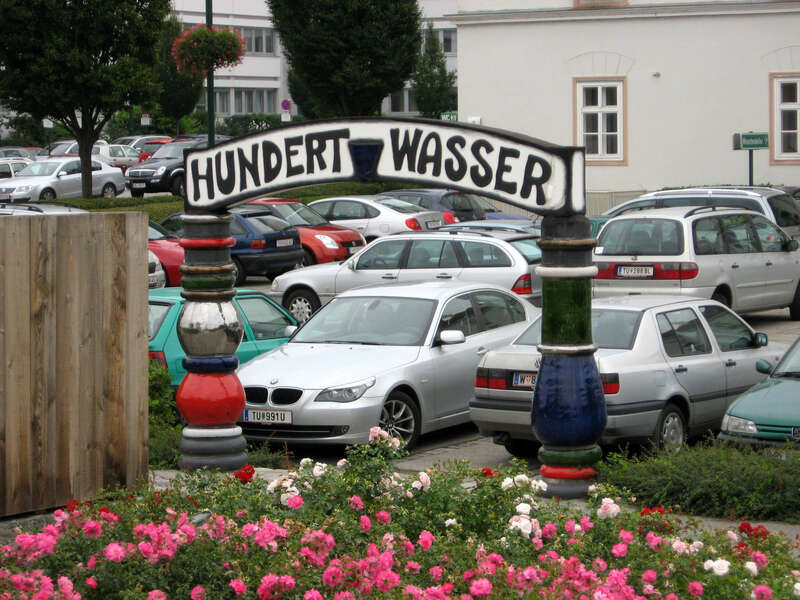 Hundertwasser is one of my favourite European artists but I'd seen most of his work already so we didn't stop for the exhibition. 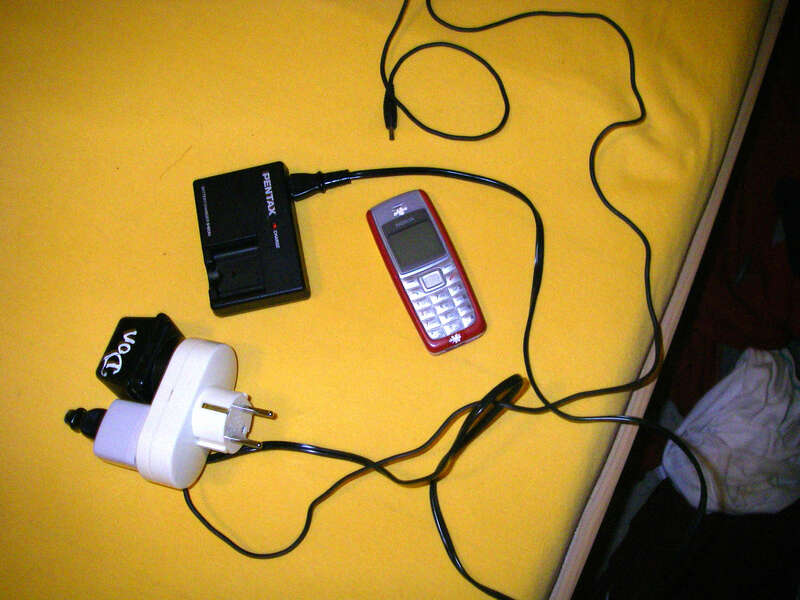 Charging was a daily chore. My waterproof camera used a rechargeable battery, though the better one used ordinary batteries. I did not have to charge my phone very often, since we rarely used it. 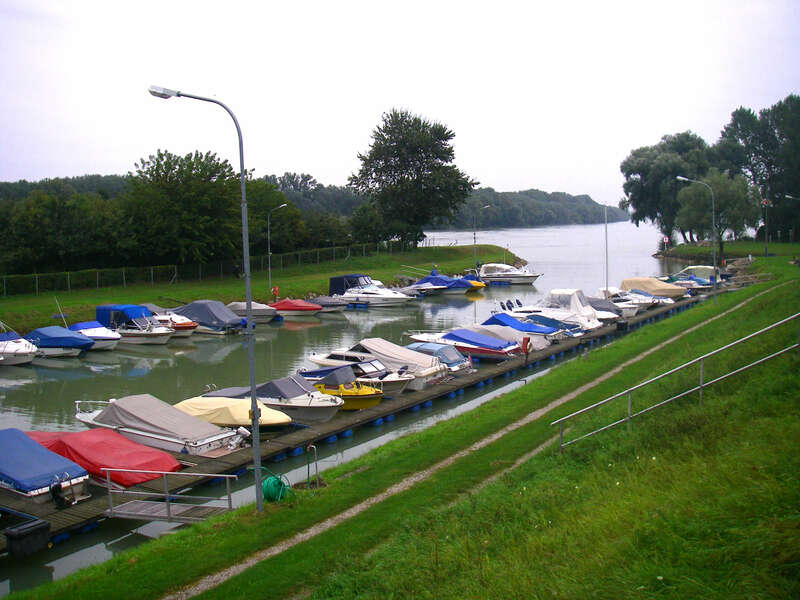 A marina leading off the Donau. 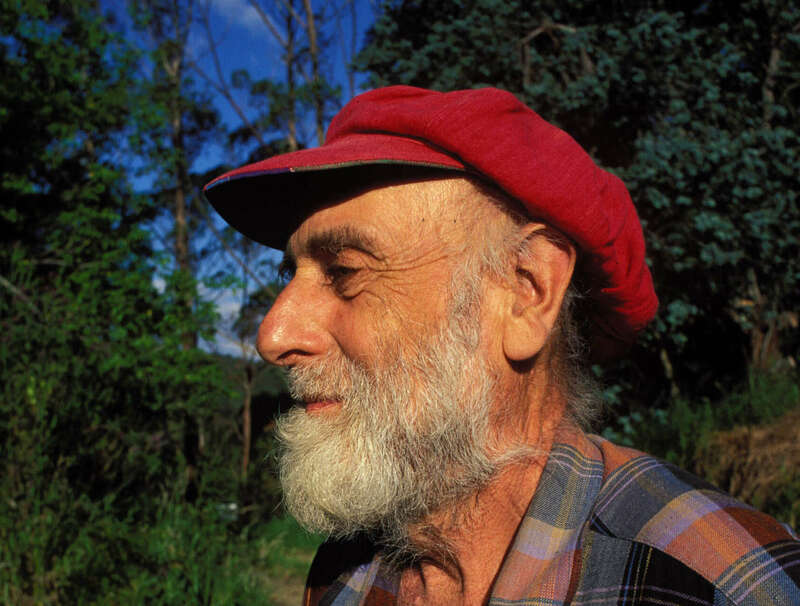 Friedensreich Hundertwasser (December 15, 1928 – February 19, 2000) was an Austrian artist who later took on New Zealand citizenship. 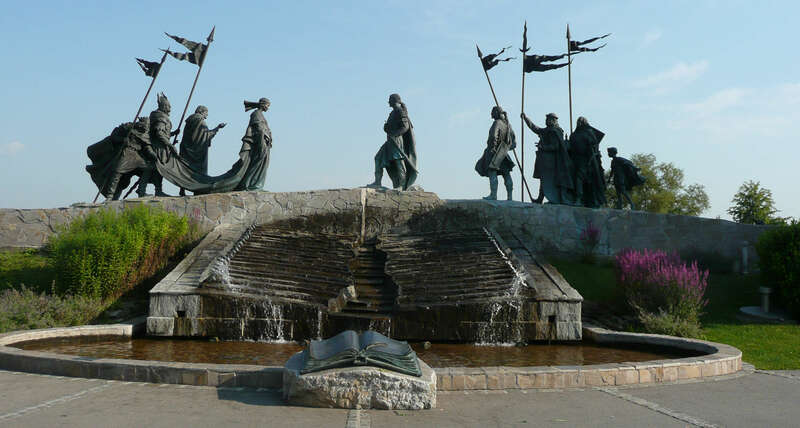 Born Friedrich Stowasser in Vienna, he became one of the best-known contemporary Austrian artists by the end of the 20th century. Photo (right): Hannes Grobe, photo taken in New Zealand in 1998. 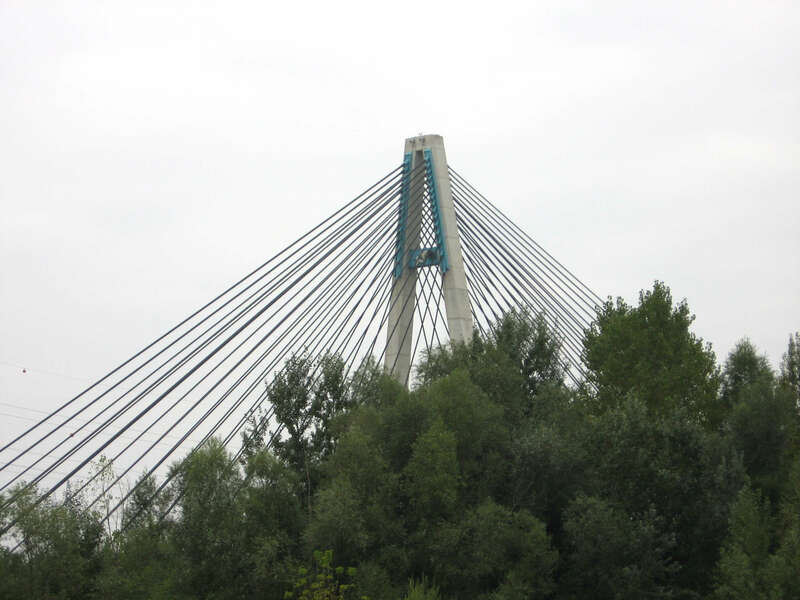 The Tulln West Bridge is a cable-stayed bridge which spans the Danube in Tulln. The maximum span is 177 m and the bridge utilises a 70 m high A-shaped pylon. This is the ship of Friedensreich Hundertwasser 'Rainy day' (Regentag). 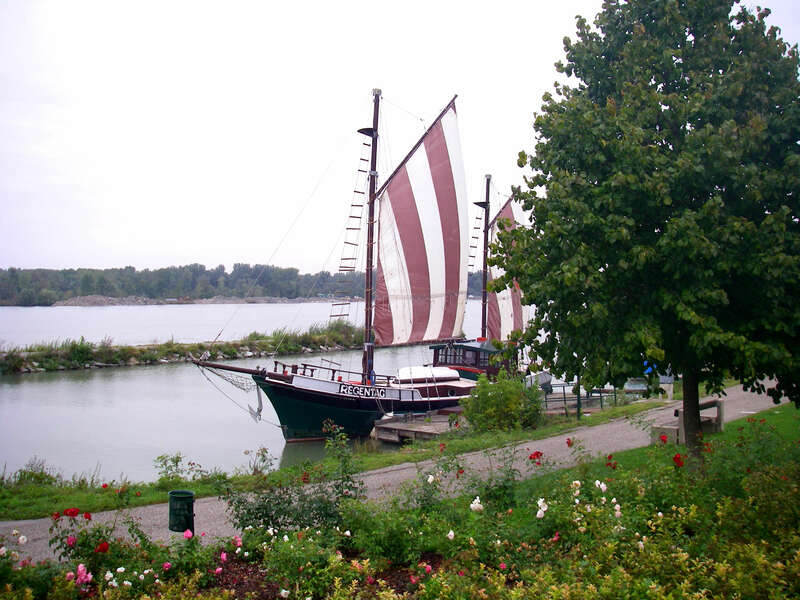 For ten years he lived and painted on the 'Regentag'. It was his home, his country, his headquarters. 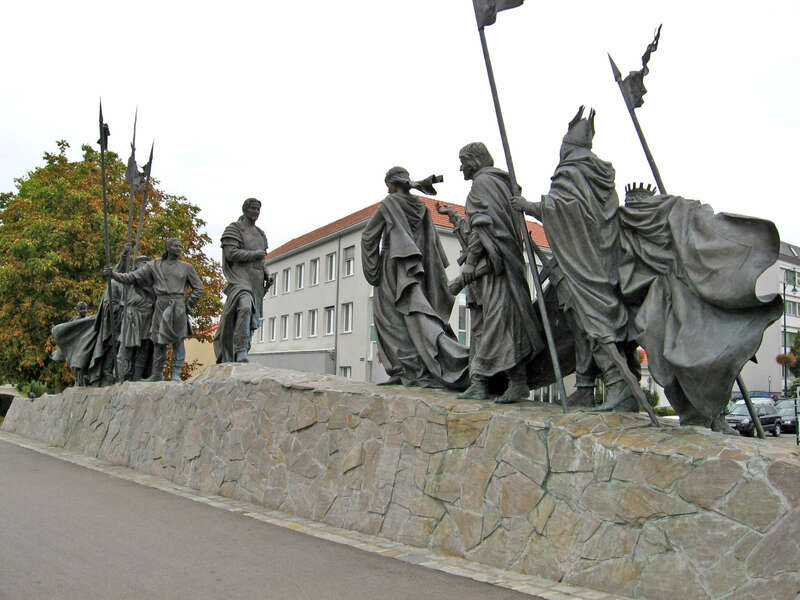 As we rode through a parkland we came across a wonderful set of scuptures depicting East meets West from the Nibelungenlied Old German saga. The sculptures were larger than life and absolutely superb.
" 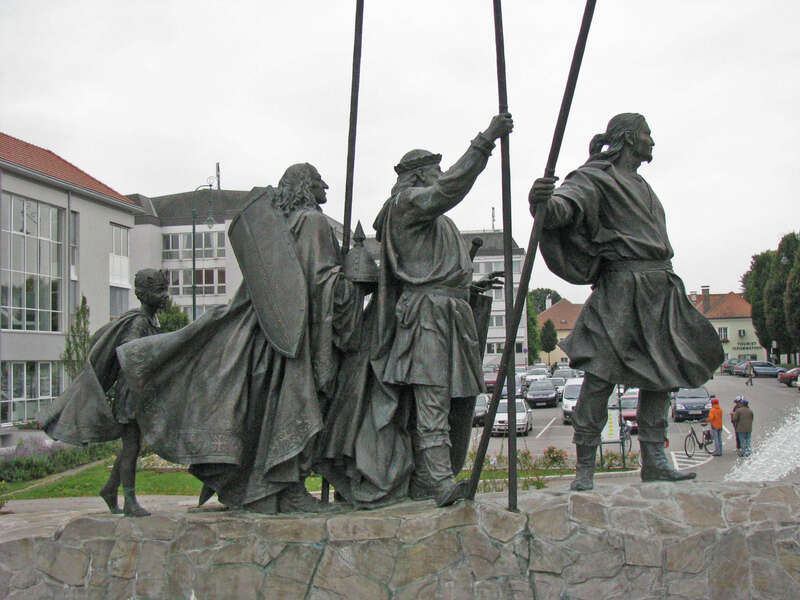 On her bridal journey into the land of the Huns, Kriemhild met King Etzel and his followers here in Tulln. This meeting was described by the poet in the noble form from 1200AD. 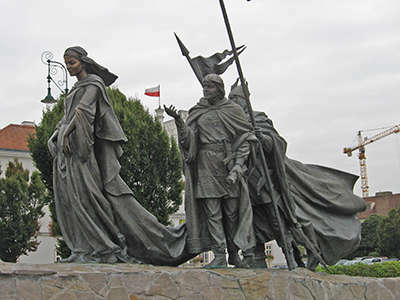 Kriemhild alights from her horse, two princes carry her train and Count Ruediger, her chaperone, introduces her to the King and his numerous followers, Germans and Huns. 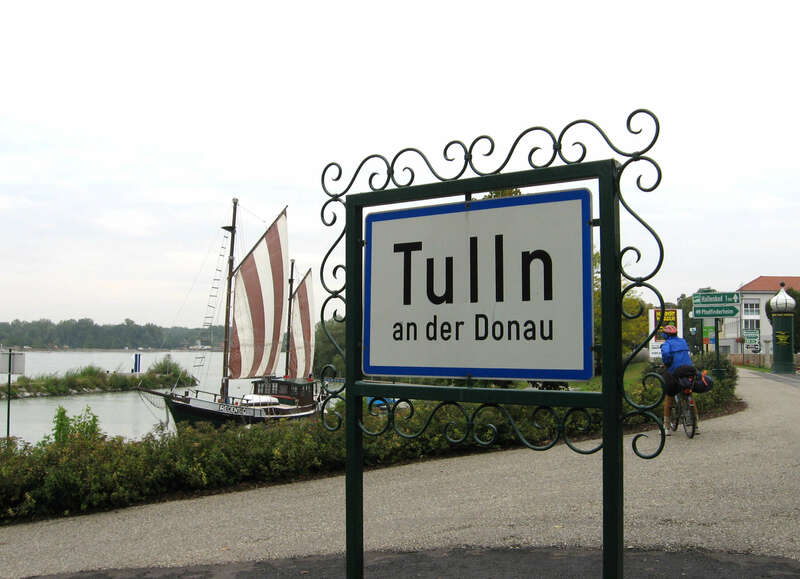 In honour of the queen, a knights tounament took place on the fields of Tulln, where Etzel was able to show the enormous might of his empire. This event is worth hundreds of verses for the poet. 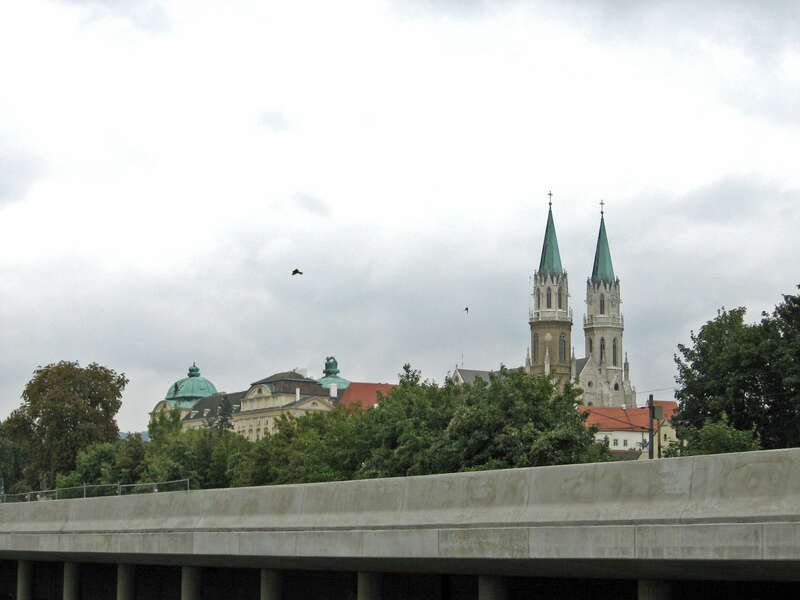 They then moved on to Vienna where there was a magnificent wedding. 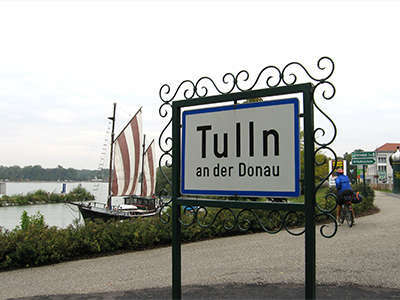 That the poet used Tulln for this important meeting in the saga, demonstrates the importance of the town around 1200. 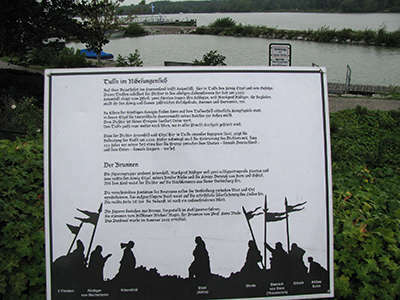 Of course the memories of the poet have some influence - 250 years before his time the border between West and East (Germany and Hungary) stood here." This memorial fountain which symbolises the meeting of East and West was constructed in 2005. 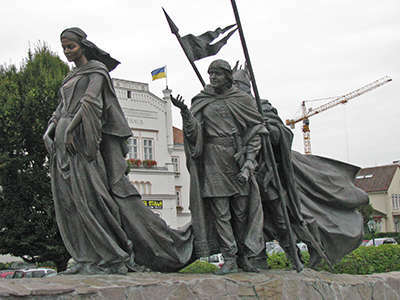 The sculpture is a superb work of art. Every figure is a delight to examine. The figures in the sculpture have distinct personalities. 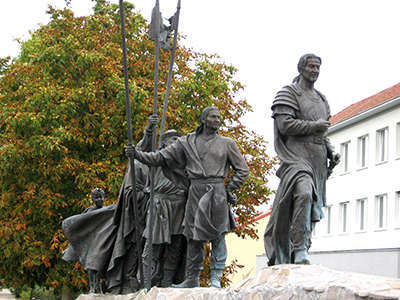 I especially liked the little boy, Attila the Hun's son, tagging along behind, and the long nosed Gibich. 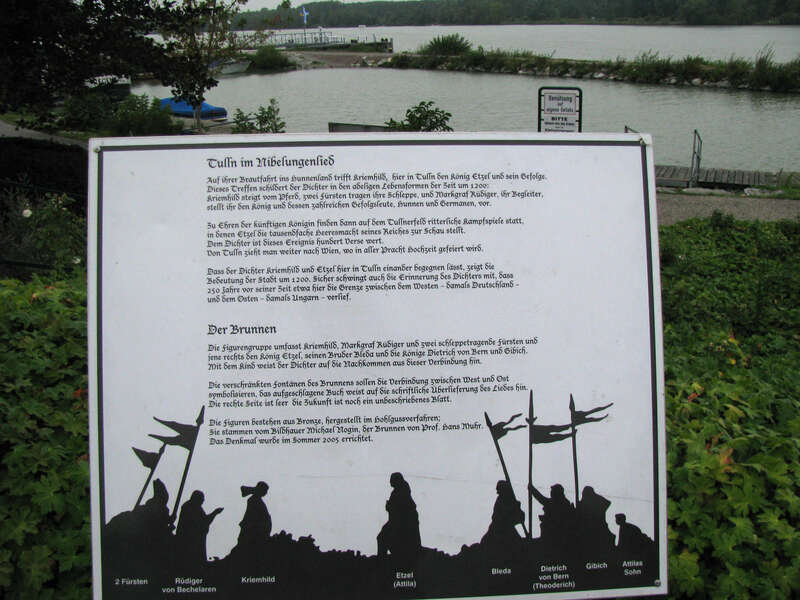 From Tulln we continued on the Treppelweg and along the way we dropped down near Langenlebarn for coffee and cake. The kiosk was a real dive and at first there was no cake but then the waitress found something in the freezer. Not the best cake we'd sampled but it had to do. It looks much better in the photo than it did in real life. 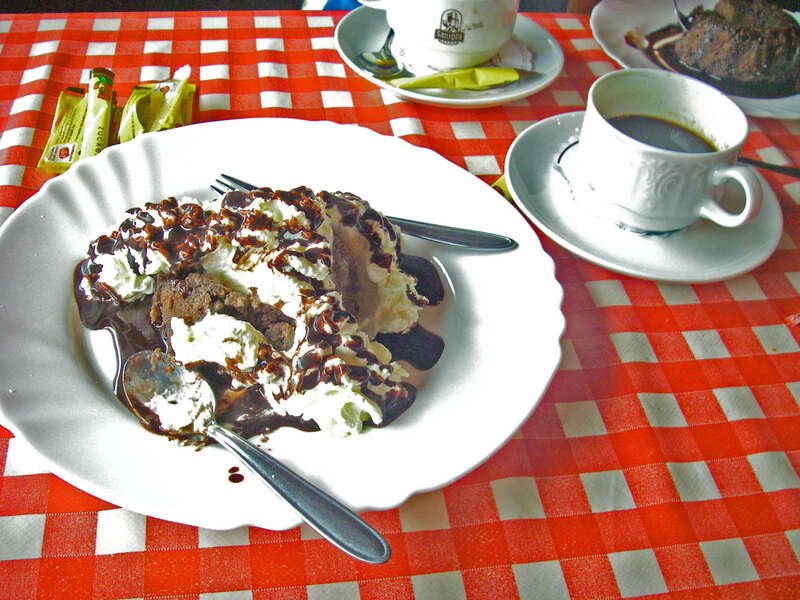 The cake and ice cream were not the best we had sampled, but welcome all the same. It was a strange place, we felt like we were intruders. It was set up, not for tourists, but for the locals, who apparently were not fussy about good furniture or good food. We stayed on the right bank, heading for Wien, Vienna. 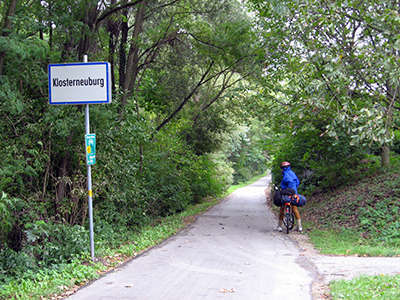 The track now went through some nice forest and leafy suburbs as we approached Klosterneuburg. 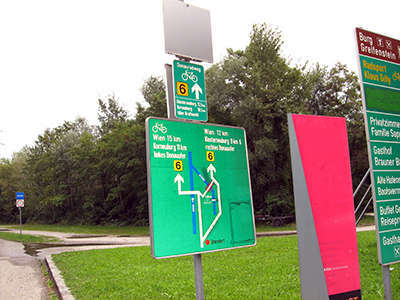 The Radweg got a bit messy because of roadworks. We picked our way around all the detours, riding through an industrial area on the edge of town, until we headed once more for the Treppelweg along the right bank of the river. 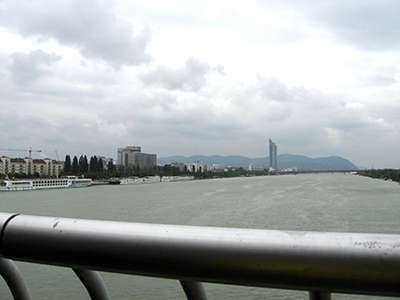 As we approached Vienna we could see all the bridges in the distance. 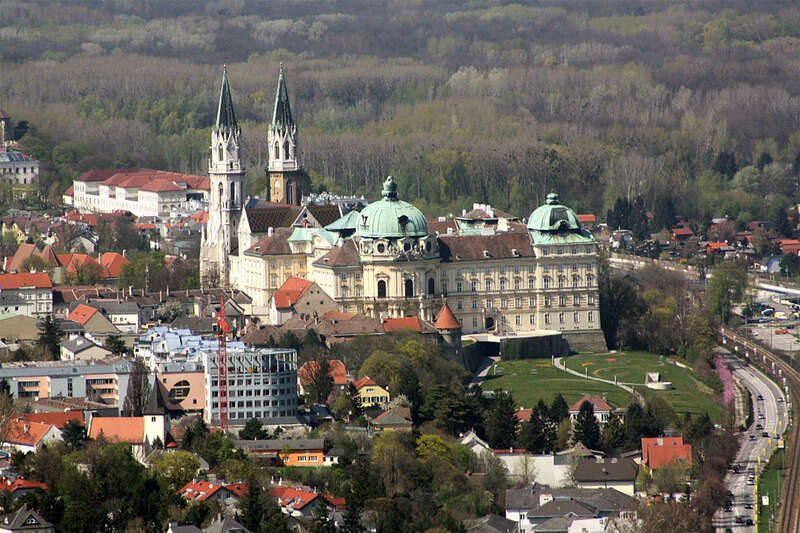 The Klosterneuburg Monastery, Stift Klosterneuburg, is a twelfth-century Augustinian monastery of the Roman Catholic Church located in the town of Klosterneuburg in Lower Austria. Overlooking the Danube river, just north of the Vienna city limits at the Leopoldsberg, the monastery was founded in 1114 by Saint Leopold III of Babenberg, the patron saint of Austria, and his second wife Agnes of Germany. 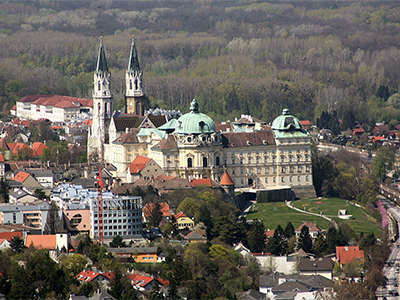 The impressive monastery complex was mostly constructed between 1730 and 1834. Its foundations, including a castle tower and a Gothic chapel, date back to the twelfth century. 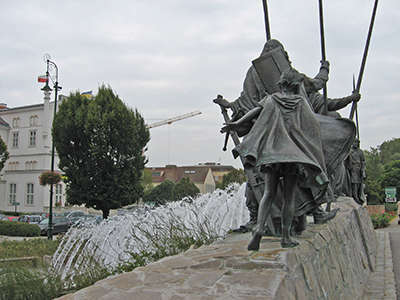 Other older buildings still extant within the complex include the chapel of 1318 with Saint Leopold's tomb. 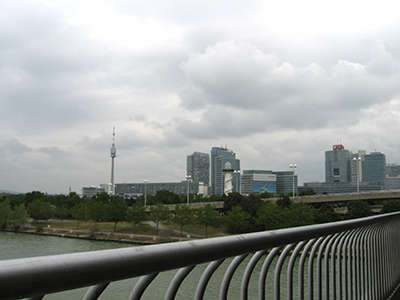 We rode along the Treppelweg under the Nordbruecke, the Florisdorferbruecke, the Nordbahn, the Brigittenauerbruecke and up to the Johann-Nestoy-Reichsbruecke which we crossed and we then found ourselves coming out at UNO city. Ursula had already told us to take the U-Bahn to Kagranerplatz. It was wonderful meeting up with her and Otto again. 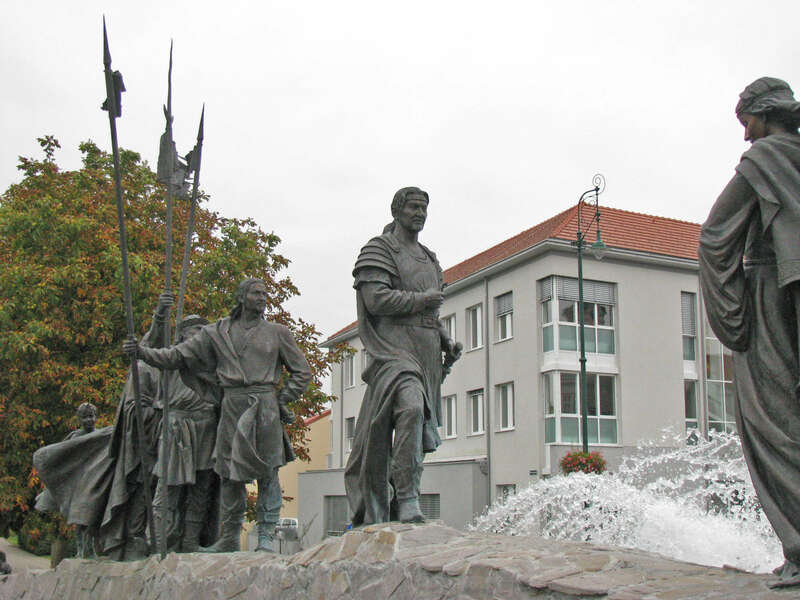 We stayed in their son's apartment for the next few days doing some sightseeing and taking a short day trip into the Czech Republic to the archaeological site of Dolni Vestonice. 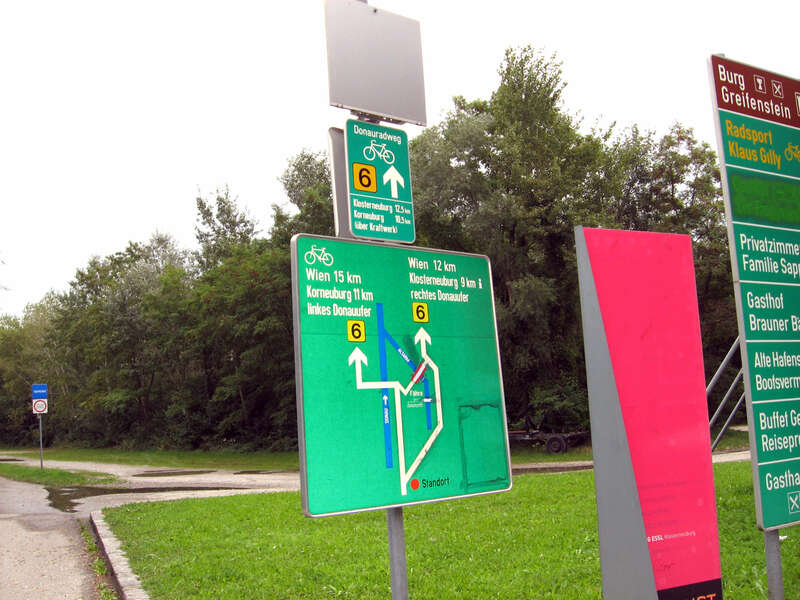 When you take the radweg, you get to see a lot of very strange environments, not all of them picture postcard varieties! The Johann-Nestoy-Reichsbruecke, often just called the Reichsbruecke. It was good to reach this major goal. 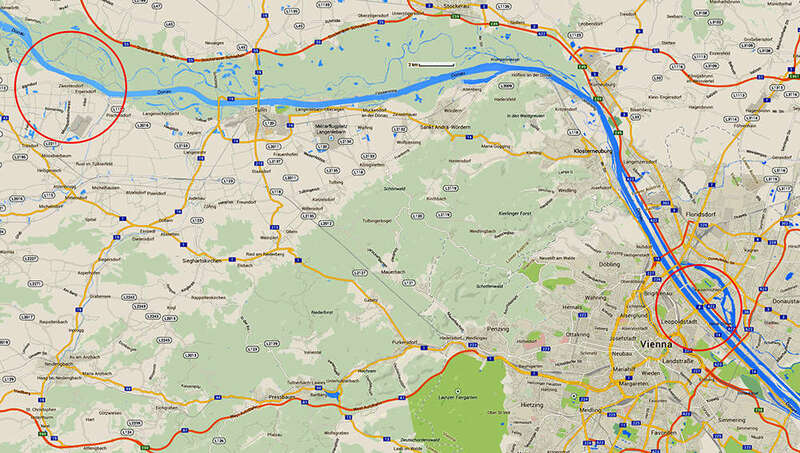 We went on from here to Budapest after a short break of a few days, but if I did it again, I would take a cruise ship or the train to Budapest, and cycle back to Vienna. 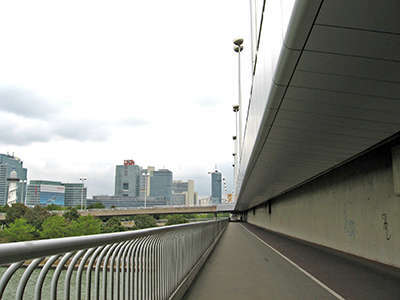 That way you are heading back to a place where it is easy to find accommodation, and where you can sell your bicycle easily, and you are always getting closer to a bicycle friendly part of the world. 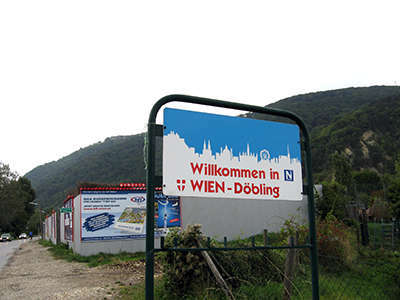 The further you head east from Vienna, the more it feels like a chore, it is harder to find accommodation, once you leave Austria there are language difficulties even if you speak english, german and french, and the less bicycle friendly the experience is.